For a limited tim, the lite version is free! If you like it and want over 380 more effects then get the full version of Composer FX Image. Composer FX Image is an application for adding visual effects to your photos. 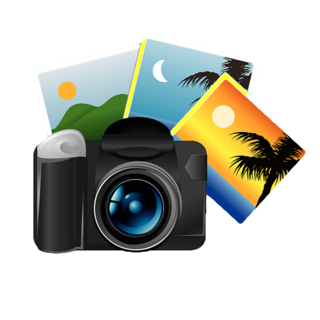 It's the perfect companion program for iPhoto and PhotoShop. Composer FX Image (Lite) has over 44 effects. Direct upload to Facebook, Flickr and Twitter. Added support for 10.9 GateKeeper. Added support for Facebook, Flickr, and Twitter. It's simple to use. 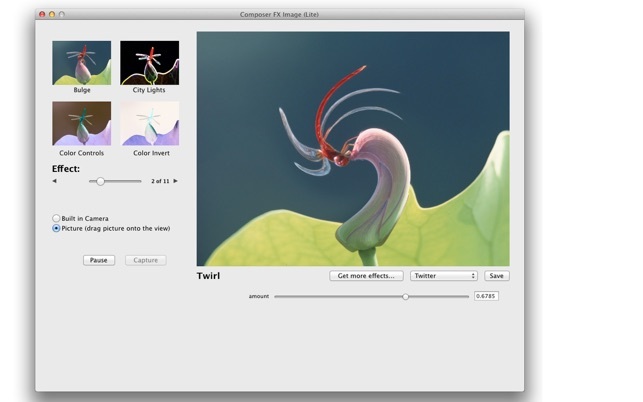 Drag an image in, mess with it, and pull it out to the desktop. I like the effects. I've used the bulge to simulate a "Mega-mind" portrait for facebook. 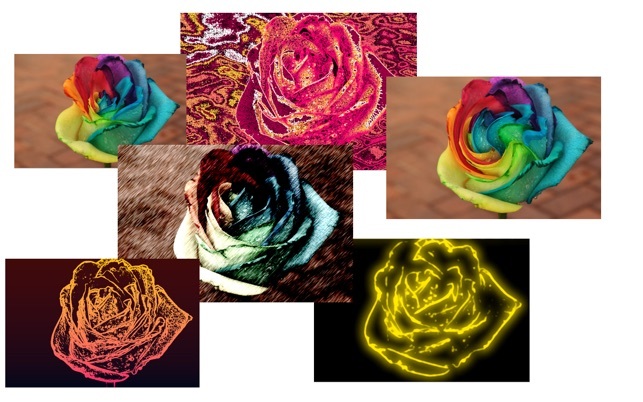 I've used many of the others(ASCII Art, City Lights, Comic Book) to create images for cards, I've used the Color Controls to create different renderings of the same photo, sliced them and put them back together for a Warhol effect.... and I -really- like the Kaliedescope effect. 2 small drawbacks (remember the price before you consider these to be "negative"): You can't combine effects unless you pull the image out and put it back in again .... and it would be awesome if Kaliedescope was somehow useable as a screen saver. The rendering is fascinating to watch. No doubt you could do the same thing in a variety of higher end applications, but this is free and does what it does with focus and simplicity. it might be nice to have the capability to choose different output formats, but for free, I am definitely not complaining. Thanks for the developers for offering a truly useful (and genuine) free application. When you purchase the more expensive edition and open it, it asks if you want to get the additional effects (a silly question) and has you select a place to place all these .qtz files (and no clue as to where they go). So far I still only have the original number of effects, and their web page is either a fake or extremely outdated, because there's no support there, and the email they left returns non-deleliverable, so I'll be calling apple soon to figure this out or get a refund!